Crown Chakra - Chakra of Consciousness. Your Crown Chakra is said to be the chakra of consciousness and pure awareness, the master chakra that controls all the others. It is about your integration as a whole, all aspects of your life and your sense of living in the now. and integrating the whole of who you are. The life lesson relating to the Sahasrara in this lifetime is about experiencing the Divine and learning to understand the Divine meaning in life. In the language of energy, the seventh chakra is the entry point of human life force itself - an invisible current of energy that endlessly pours into your energy system, nourishing every part of your body, mind and spirit. Imagine integrating a healthy life force energy into your whole being and transcending all limitations. A healthy life force has vitality and very clear focus to it. This aspect of focus is very significant because it means that you have a level of awareness regarding where you invest the energy of your life. In other words, it indicates that you are mindful of your personal value and as such, you invest energy, time and attention with care, thoughtfulness and wisdom. The color for your crown is a mixture of Silver (yin), Gold (yang) and White/Violet. The silver in this chakra is your feminine energy of creation, the gold in the chakra is your masculine energy of creation, and the white/violet light is truth and clarity which gives you a clear vision of the truth as well as protection. 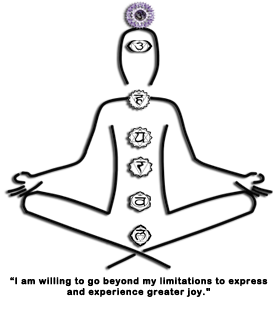 Learn how the balancing of this master chakra can affect all the other chakras. Learn about your Crown Chakra as is your connection to the greater world beyond, to a timeless, spaceless place of all-knowing. When developed, this chakra brings you knowledge, wisdom, understanding, spiritual connection and bliss. Located on top of head. Union, enlightenment, knowledge, spirituality, understanding, self-realization, connection, fulfilment, completion, mysticism, universal consciousness, awareness. Upper skull, skin, nervous system, mind and whole body. Violet, white, silver, gold - uncover the full spectrum of Healing with Color. Amethyst, Sugilite, Clear Quartz, Morganite, Rainbow Moonstone, Herkimer Diamond - to learn more about Crystal Healing see "The Power of Quartz - A Course in Healing with Crystals. Click here for a Crown Chakra Affirmation to be repeated 15 times once or twice a day. When this chakra is open, you connect with the Godhead, the "All That Is" and the Source of the White Light comes into your energy field.